Posted on March 31, 2014, 2:02 pm, by Google Webmaster Central, under crawling and indexing, intermediate, verification, webmaster tools. The Google Webmaster Tools Index Status feature reports how many pages on your site are indexed by Google. In the past, we didn’t show index status data for HTTPS websites independently, but rather we included everything in the HTTP site’s report. In the last months, we’ve heard from you that you’d like to use Webmaster Tools to track your indexed URLs for sections of your website, including the parts that use HTTPS. We’ve seen that nearly 10% of all URLs already use a secure connection to transfer data via HTTPS, and we hope to see more webmasters move their websites from HTTP to HTTPS in the future. We’re happy to announce a refinement in the way your site’s index status data is displayed in Webmaster Tools: the Index Status feature now tracks your site’s indexed URLs for each protocol (HTTP and HTTPS) as well as for verified subdirectories. The refined data will be visible for webmasters whose site’s URLs are on HTTPS or who have subdirectories verified, such as https://example.com/folder/. Data for subdirectories will be included in the higher-level verified sites on the same hostname and protocol. An “Update” annotation has been added to the Index Status graph for March 9th, showing when we started collecting this data. This change does not affect the way we index your URLs, nor does it have an impact on the overall number of URLs indexed on your domain. It is a change that only affects the reporting of data in Webmaster Tools user interface. In order to see your data correctly, you will need to verify all existing variants of your site (www., non-www., HTTPS, subdirectories, subdomains) in Google Webmaster Tools. We recommend that your preferred domains and canonical URLs are configured accordingly. Note that if you wish to submit a Sitemap, you will need to do so for the preferred variant of your website, using the corresponding URLs. Robots.txt files are also read separately for each protocol and hostname. We hope that you’ll find this update useful, and that it’ll help you monitor, identify and fix indexing problems with your website. You can find additional details in our Index Status Help Center article. As usual, if you have any questions, don’t hesitate to ask in our webmaster Help Forum. Posted on October 1, 2013, 6:13 am, by Maile Ohye, under advanced, crawling and indexing, intermediate. Webmaster Level: Intermediate to Advanced We filmed a video providing more details about expanding your site to more languages or country-based language variations. The video covers details about rel=”alternate” hreflang and potential implementation on your multilingual and/or multinational site. Posted on April 8, 2013, 10:09 pm, by Maile Ohye, under advanced, crawling and indexing, intermediate. Webmaster Level: Intermediate to Advanced Including a rel=canonical link in your webpage is a strong hint to search engines your about preferred version to index among duplicate pages on the web. It’s supported by several search engines, including Yahoo!, Bing, and Google. 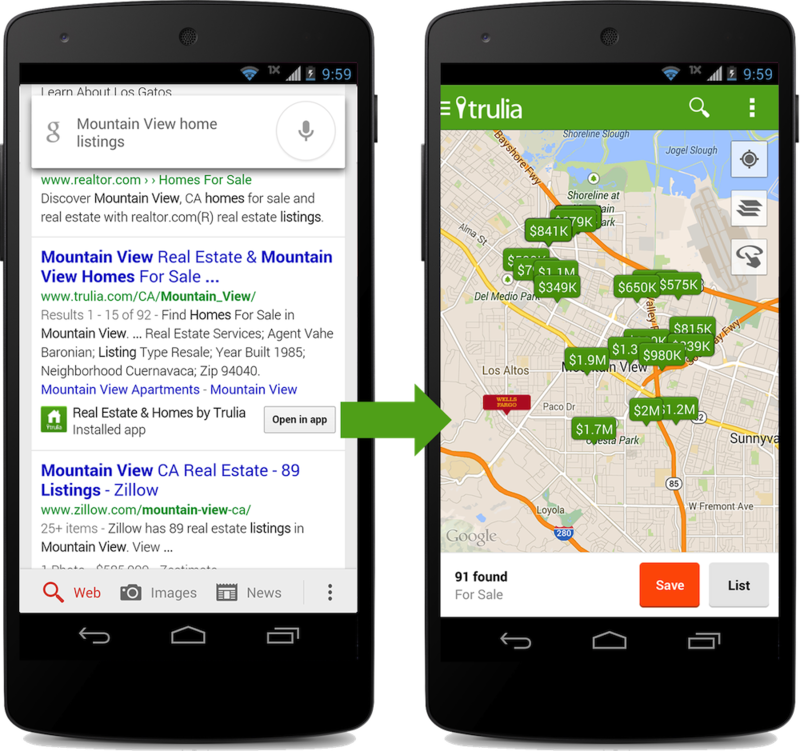 The rel=canonical link consolidates indexing properties from the duplicates, like their inbound links, as well as specifies which URL you’d like displayed in search results. However, rel=canonical can be a bit tricky because it’s not very obvious when there’s a misconfiguration. While the webmaster sees the “red velvet” page on the left in their browser, search engines notice on the webmaster’s unintended “blue velvet” rel=canonical on the right. A large portion of the duplicate page’s content should be present on the canonical version. One test is to imagine you don’t understand the language of the content—if you placed the duplicate side-by-side with the canonical, does a very large percentage of the words of the duplicate page appear on the canonical page? If you need to speak the language to understand that the pages are similar; for example, if they’re only topically similar but not extremely close in exact words, the canonical designation might be disregarded by search engines. Specify no more than one rel=canonical for a page. When more than one is specified, all rel=canonicals will be ignored. Specifying a rel=canonical from page 2 (or any later page) to page 1 is not correct use of rel=canonical, as these are not duplicate pages. Using rel=canonical in this instance would result in the content on pages 2 and beyond not being indexed at all. Good content (e.g., “cookies are superior nutrition” and “to vegetables”) is lost when specifying rel=canonical from component pages to the first page of a series. In cases of paginated content, we recommend either a rel=canonical from component pages to a single-page version of the article, or to use rel=”prev” and rel=”next” pagination markup. 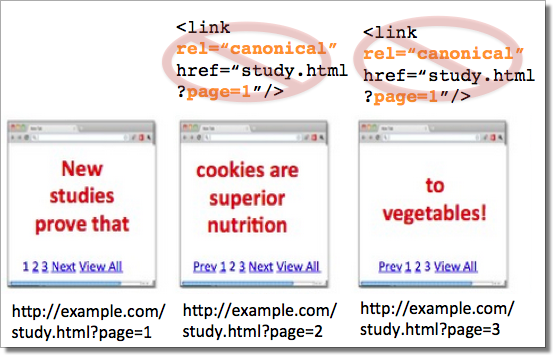 If rel=canonical to a view-all page isn’t designated, paginated content can use rel=”prev” and rel=”next” markup. The <link> tag, like many HTML tags, accepts both relative and absolute URLs. Relative URLs include a path “relative” to the current page. For example, “images/cupcake.png” means “from the current directory go to the “images” subdirectory, then to cupcake.png.” Absolute URLs specify the full path—including the scheme like http://. 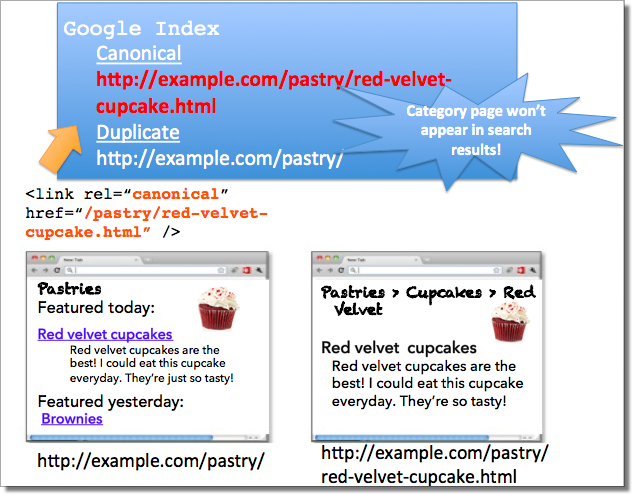 Specifying <link rel=canonical href=“example.com/cupcake.html” /> (a relative URL since there’s no “http://”) implies that the desired canonical URL is http://example.com/example.com/cupcake.html even though that is almost certainly not what was intended. In these cases, our algorithms may ignore the specified rel=canonical. Ultimately this means that whatever you had hoped to accomplish with this rel=canonical will not come to fruition. Mistake 3: Unintended or multiple declarations of rel=canonical Occasionally, we see rel=canonical designations that we believe are unintentional. In very rare circumstances we see simple typos, but more commonly a busy webmaster copies a page template without thinking to change the target of the rel=canonical. Now the site owner’s pages specify a rel=canonical to the template author’s site. If you use a template, check that you didn’t also copy the rel=canonical specification. 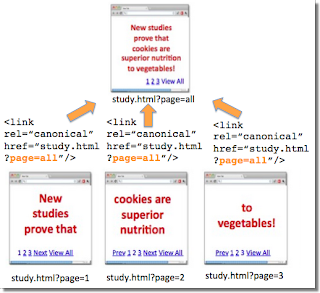 Another issue is when pages include multiple rel=canonical links to different URLs. This happens frequently in conjunction with SEO plugins that often insert a default rel=canonical link, possibly unbeknownst to the webmaster who installed the plugin. In cases of multiple declarations of rel=canonical, Google will likely ignore all the rel=canonical hints. Any benefit that a legitimate rel=canonical might have offered will be lost. In both these types of cases, double-checking the page’s source code will help correct the issue. Be sure to check the entire <head> section as the rel=canonical links may be spread apart. Check the behavior of plugins by looking at the page’s source code. Mistake 4: Category or landing page specifies rel=canonical to a featured article Let’s say you run a site about desserts. Your dessert site has useful category pages like “pastry” and “gelato.” Each day the category pages feature a unique article. 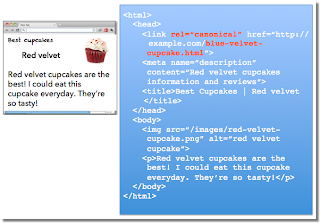 For instance, your pastry landing page might feature “red velvet cupcakes.” Because the “pastry” category page has nearly all the same content as the “red velvet cupcake” page, you add a rel=canonical from the category page to the featured individual article. If we were to accept this rel=canonical, then your pastry category page would not appear in search results. That’s because the rel=canonical signals that you would prefer search engines display the canonical URL in place of the duplicate. However, if you want users to be able to find both the category page and featured article, it’s best to only have a self-referential rel=canonical on the category page, or none at all. Remember that the canonical designation also implies the preferred display URL. 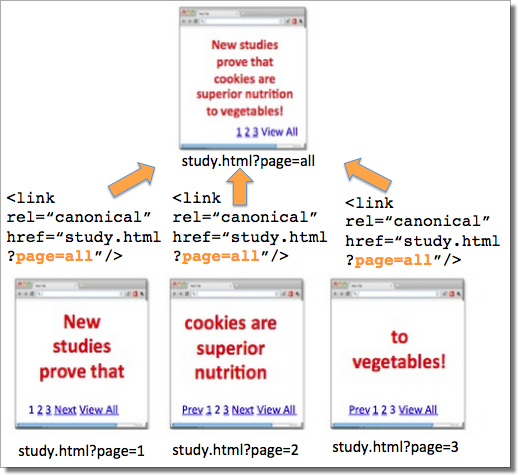 Avoid adding a rel=canonical from a category or landing page to a featured article. 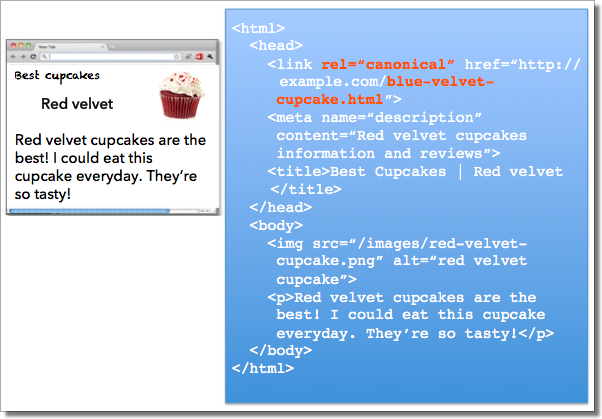 Mistake 5: rel=canonical in the <body> The rel=canonical link tag should only appear in the <head> of an HTML document. Additionally, to avoid HTML parsing issues, it’s good to include the rel=canonical as early as possible in the <head>. When we encounter a rel=canonical designation in the <body>, it’s disregarded. This is an easy mistake to correct. Simply double-check that your rel=canonical links are always in the <head> of your page, and as early as possible if you can. rel=canonical designations in the <head> are processed, not the <body>. 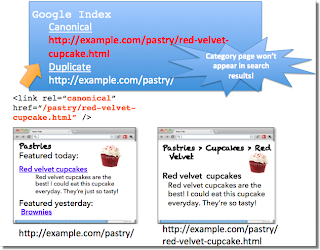 Verify that most of the main text content of a duplicate page also appears in the canonical page. Check that rel=canonical is only specified once (if at all) and in the <head> of the page. Check that rel=canonical points to an existent URL with good content (i.e., not a 404, or worse, a soft 404). Avoid specifying rel=canonical from landing or category pages to featured articles as that will make the featured article the preferred URL in search results. Posted on March 25, 2013, 9:39 pm, by Pierre Far, under crawling and indexing, search results. Posted on March 14, 2013, 2:30 pm, by Google Webmaster Central, under beginner, crawling and indexing, general tips. Everyone knows someone who just set up their first blog on Blogger, installed WordPress for the first time or maybe who had a web site for some time but never gave search much thought. We came up with a first steps cheat sheet for just these folks. It’s a short how-to list with basic tips on search engine-friendly design, that can help Google and others better understand the content and increase your site’s visibility. We made sure it’s available in thirteen languages. Please feel free to read it, print it, share it, copy and distribute it! We hope this content will help those who are just about to start their webmaster adventure or have so far not paid too much attention to search engine-friendly design. Over time as you gain experience you may want to have a look at our more advanced Google SEO Starter Guide. As always we welcome all webmasters and site owners, new and experienced to join discussions on our Google Webmaster Help Forum.